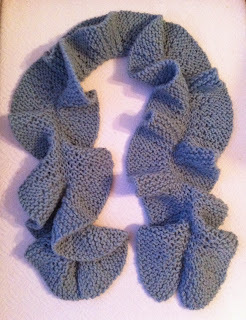 This was a wonderful scarf to knit and such fun, the Potato Chip Scarf spirals around as you knit and coils up neatly. The project called for a DK weight yarn however I went with the worsted weight yarn for more loft and used a size #9 needle. I will definitely be making this scarf again. This is the first knitted project I made with someone in mind it will be a surprise holiday gift for a very good friend.